Holiday Feasting Can Begin with The Lube® New Menu Featuring the Return Of Classic Favorites! WESTLAKE, OH – The award-winning family casual-dining restaurant Quaker Steak & Lube®, is kicking off the holiday season with a $25,000 Holiday Sweepstakes promotion. Now through December 31, 2017, guests purchasing $50 in Quaker Steak & Lube® gift cards at participating restaurants will receive a bonus card worth $10 off a Lube dining experience in January or February, 2018. The bonus card also includes a scratch off code that guests can submit online to enter to win one of seven weekly $1,000 prizes, and the grand prize of $25,000. The lube welcomes all lone star guests! WESTLAKE, OH – The award-winning family casual-dining restaurant Quaker Steak & Lube®, is recognizing the valiant efforts of all military veteran and active-duty service members by offering free or discounted meals on Veterans Day, Saturday, Nov. 11, 2017, at participating locations. Five Meal Selections Now Available For Just $10! WESTLAKE, OH – The award-winning family casual-dining restaurant Quaker Steak & Lube®, is making Tuesdays the favorite day of the week with its new "$10 Tuesdays" meal deals. Beginning today, guests can find more menu choices at a greater value with five Lube favorites priced at just $10 each, all day, every Tuesday, at participating locations. Two Custom Built Combo Meals Just $20; Twenty-Five Different Meal Combinations Now Available! WESTLAKE, OH – The award-winning family casual-dining restaurant Quaker Steak & Lube®, is rolling out its best deal yet on the restaurant’s famed Custom Built Combo meals. With the "Double Take" promotion, guests can receive two Custom Built Combo meals for just $20. These affordably priced, hearty, and delicious meals can be enjoyed at The Lube®, or taken to-go with The Lube®’s easy online ordering and pick-up. The "Double Take" offer is available all day, every day at participating Quaker Steak & Lube® restaurants. Tie-In with Rock Music Legend Also part of Fall’s food line-up! WESTLAKE, OH – The award-winning family casual-dining restaurant Quaker Steak & Lube®, invites guests to its new menu release showcasing bold new tastes for fall. The Lube® has paired flavorful entrees and delicious desserts, as well as crisp drinks, available for a limited time at Quaker Steak & Lube locations nationwide. WESTLAKE, OH – The award-winning family casual-dining restaurant Quaker Steak & Lube®, in partnership with Budweiser® and Anheuser-Busch wholesalers, has raised $11,248 for the Folds of Honor organization, which honors the sacrifices of fallen and disabled service men and women by providing educational scholarships for their spouses and children. 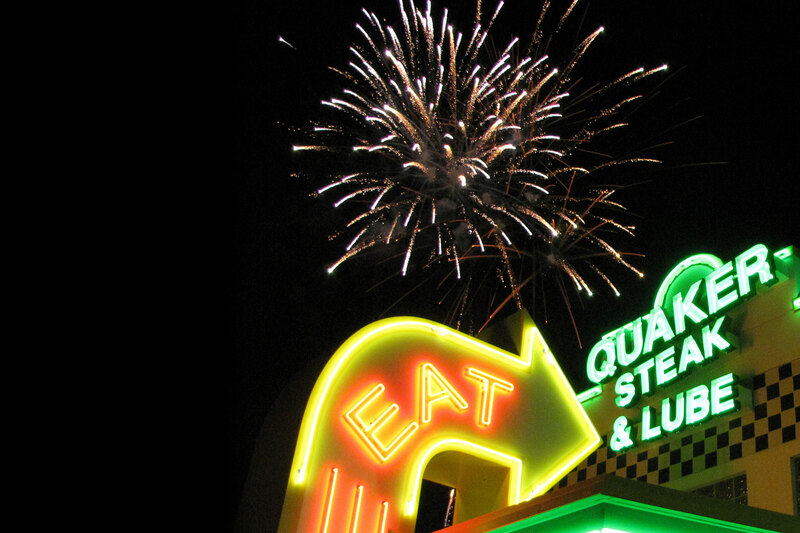 Donations were garnered from Quaker Steak & Lube guests from Memorial Day through July 4th. WESTLAKE, OH – The award-winning family casual-dining restaurant, Quaker Steak & Lube®, is upping the wing game nationwide with the biggest and meatiest indulgence fans can get for National Chicken Wing Day with new Bangin’ Drums! Three times bigger than Quaker Steak & Lube®’s famous Jumbo Wings, the new Bangin’ Drums! are prepared to provide the same great taste as the famed wings — with a light breading, fried golden, and flavored by of one of 20 familiar sauces, including award-winning favorites like Kentucky Bourbon Glaze and the newest fan favorite, Smoked Jalapeño Honey. WESTLAKE, OH – The fun family casual-dining franchise Quaker Steak & Lube®, known for its award-winning food, including Best Wings USA and more than 20 sauces, announced today that industry veteran Bruce Lane has joined its executive team as vice president of franchise services. TA Restaurant Group, which acquired Quaker Steak & Lube® in 2016, appointed Lane as part of its aggressive strategy to reinvigorate the 43-year-old brand and grow Quaker Steak & Lube® into a nationally recognized concept through franchising. Quaker Steak & Lube® feels the success of the brand coincides with the success of their franchise community. Therefore, in his new role, Lane will be fully engaged in all aspects of the business, responsible for leading the brand’s supercharged franchise development efforts, franchise operations and spearheading strategic efforts to expand the popular restaurant chain’s footprint nationwide. WESTLAKE, OH – The award-winning family casual-dining restaurant Quaker Steak & Lube®, is pushing summer into overdrive with a revamped drink menu filled with new makes and models of refreshing, handcrafted cocktails and craft beers. Paired with The Lube’s® new, limited-time seasonal dining menu, the pace is set for a season filled with flavorful fun. WESTLAKE, OH – The award-winning family casual-dining restaurant Quaker Steak & Lube®, is combining forces with Budweiser® to garner donations for the Folds of Honor organization, which honors the sacrifices of fallen and disabled service men and women by providing educational scholarships for their spouses and children. From May 27 through July 4, Quaker Steak & Lube® guests will have the opportunity to donate by rounding their check up to the next dollar, or more, and make a difference for these families.